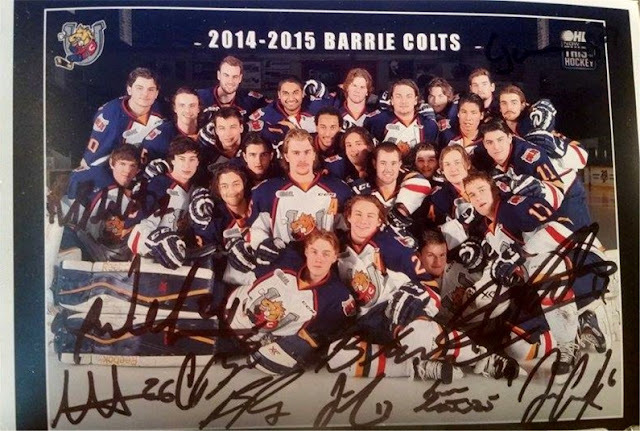 A Very Barrie Colts Instagram Giveaway! #OHL - Very Barrie Colts | A website covering the Barrie Colts of the OHL. We are excited to announce our second giveaway at the blog! Last year, Chris Barron won a signed 20th Anniversary flag signed at last years Blue and White game in our first social media contest. This years will be a little easier. This year we got a signed team picture at the Blue and White (5x7 inches) and we would like to give it away to an Instagram follower! Not the biggest prize but something cool for a Colts fan, especially if you wanted to go to the Blue and White game but couldn't make it. The image is signed by Mangiapane, Labanc, Scott, Bauman, Nattinen, Carrick, James, Webster and Badenhorst! Entering the contest is pretty simple. Like the image on on our Instagram associated with this contest which can be seen below. The winner will be chosen on Monday, September 21st! Best of luck!